For the most part, the Inca military was organized very much like our modern army. Based on decimal units; a troop of ten men had a corporal, and five groups of ten had a sergeant. This order continued with officers overseeing groups of 100, 500, 1,000, and 5,000. The ultimate commander was the sapa inca (emperor). Outstanding service in the military was rewarded regardless of the warriors social position. Hand-to-hand combat was the most common form of fighting. The Incas used battle axes and lances made of copper, bronze, and stone. However, these weapons were not sharp enough to penetrate Spanish armor. Also, they used an assortment of clubs. The largest, the porra, required two hands. It consisted of a long wooden handle with a ball of copper or stone that had five or six protruding points. The porra was not capable of penetrating a Spanish helmet. One of their most effective weapons used by the Inca was a sling or warak'a. It threw rocks with such force that they could break a Spanish sword in two. The Incas did use the bow and arrow, but they were not very accurate and they were also useless against Spanish armor. Inca soldiers were between the ages of 25 and 50. All had extensive military training. They wore cotton or alpaca tunics, and their helmets were made of wicker. Many of the helmets were adorned in brightly colored feathers. Also, they wore thickly quilted cotton armor. The Inca lined up according to the weapon they carried. Those that carried weapons that could strike from a distance were placed on the front line. These included archers, sling throwers, and javelin hurlers. They were followed by the ax and club wielding troops. 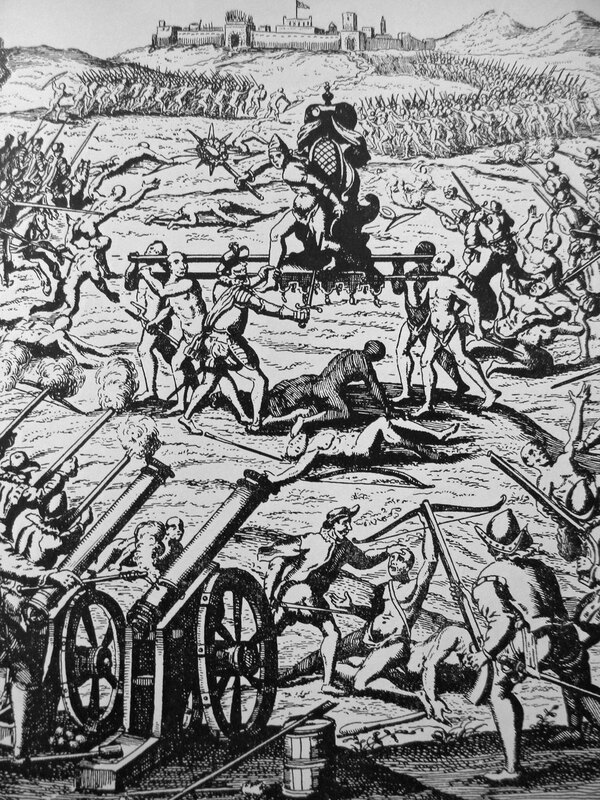 Inca military commanders were carried aloft onto the battlefield in litters. Prior to entering battle the emperor and his troops fasted. The fasting concluded with a huge feast and the consumption of enormous amounts of corn beer. Inca military strategy was not complicated. They divided their forces into three groups. The first group attacked from the front while the other two groups circled and attacked from the rear. The Inca also cut off water supplies, communication, and food supplies. As the Incas approached their enemies they made earsplitting noise. They blew conch horns, whistles, beat drums, danced, and shouted. This strategy would frighten the opposing forces. Sometimes the Inca military would add to their arsenals the weapons of the countries that they had defeated. This is how they discovered the bola which was very effective against the Spanish horses. The bola was a rope with three stones attached, and when thrown correctly it could encircle the arms and legs of the enemy.